Enjoy our Paradise in Maui only steps away from the best beach on the island! We are also in the heart of Kihei within walking distance of fantastic restaurants, incredible happy hours, shopping, and more. Fall in love with the 3 private pools, and 6 tennis courts on property. The renovation of the entire unit was finished 2/1/2016 including porcelain tile floors, full kitchen, all cabinets, new bathroom, and more. All appliances in the unit were also purchased brand new including the refrigerator, range, dishwasher, ventless washer/dryer, and microwave. From the towels to beach toys, you won't find a single old item to use. You'll have everything you need right here at our island getaway. 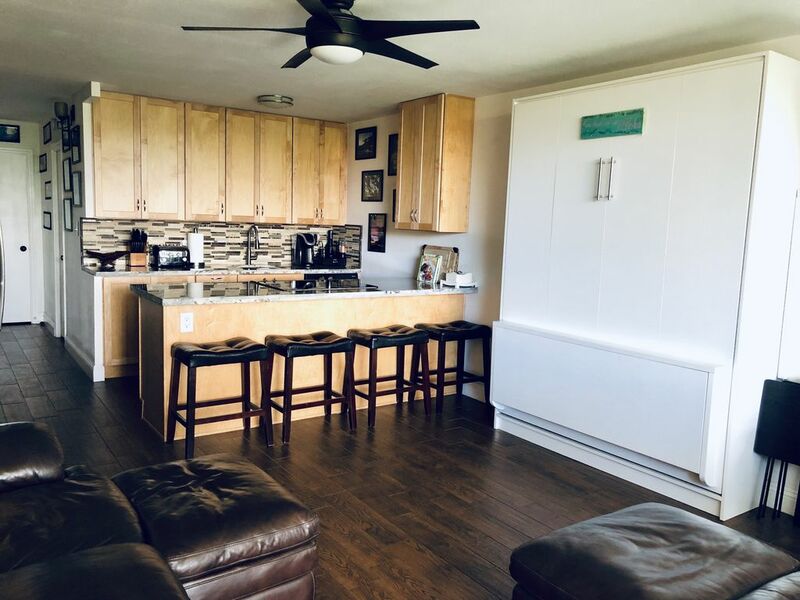 As of 4/2019 we also added a brand new mini split AC unit, brand new windows, updated art, new lanai furniture, and new towels. In the living room, you'll enjoy the comfort of the 55" tv equipped with cable tv, Apple TV and Netflix. There is also a new AC unit to keep you cool during the heat of the day. The tv is wall mounted on an incredible swivel mount so you can turn the tv and watch from the kitchen or even the lani. Take pleasure watching the evening sunset with a glass of wine or a Mai Tai while you sit on the back lani on the new furniture purchased 4/2019. There are also 4 built in hangers outside to hang your wet beach towels and bathing suits for natural drying! We also have installed a custom Hawaiian made queen sized murphy bed with retractable office table to accommodate more guests. The mattress is the same pillow top luxury brand as the King in the bedroom. Now all 4 guests will sleep in ultimate comfort during your stay. If you love to cook, this kitchen has it all! From cooking/grilling utensils, pots/pans, rice cooker, crock pot, blender, knives, cutting boards, flat electric griddle, and more. You won't find anything in the kitchen that won't cover your cooking needs. The dishes, wine glasses, coffee mugs, and even champagne glasses are all beautifully placed for your delight. And don't forget the electric wine opener and Keurig machine for those wine and coffee lovers. For those of you who like coffee in a french press or tea in a kettle, you won't be disappointed. The Maui Vista also has gas grills located right outside the front door of the condo on the ground floor for your use any time of the day or night. The bathroom includes a beautiful tile walk in shower with double shower heads and a pebble non-slip floor. The beautiful rain glass makes this modern bathroom a delight. There's also a corner bench built in if you need to take a seat while you shower. Need to wash off your feet without taking a shower? You can remove one of the shower heads to easily wash anything without getting fully wet. Also included is a hair dryer, curling iron and electric vanity mirror. There are also 4 towel racks for your convenience to hang up multiple towels. The bedroom has a lovely pillow top king sized bed and ikea bed frame with drawers beneath. Comfort is an understatement with this addition to make your sleep perfection. We also have an energy efficient air conditioning unit directly in the bedroom so you can stay comfortable all night long. Enjoy watching a late night movie with Apple tv on the 44" flat screen tv. The closet has been set up with a fantastic closet organizer giving you plenty of room for all your clothes. Worried about beach gear? We've got it all. Beach chairs, boogie boards, coolers, beach toys, blow up rafts, beach towels, velcro ball gloves, tennis rackets, and tennis balls. We also have a safe in the unit to keep those valuables tucked away without any added worry. Lastly, we have FREE WIFI AND FREE INTERNATIONAL CALLING!!! Grab this unit before it goes to fast. We look forward to hosting you at our island paradise! Mike and Becca live part of the year on Maui as well as Boise, ID where they have two puppies - Sophie and Mimi. They travel around the world working in the marching band and color guard activities as designers and adjudicators. They love film (check out the Maui Film Festival), art, food, and wine. They also love sun, relaxation, and a good Mai Tai! After traveling to Maui for 12 years, they decided in 2015 to buy a piece of paradise to share with you. Maui Vista has an incredible location where you don't even need a car to get around to experience some of the best things the island has to offer. Walk North down S. Kihei Rd and find surfing lessons, the best breakfast on the island at Kihei Cafe, or a delicious dinner at Three's Bar and Grill. Walk South down S. Kihei Rd and find another great breakfast/dinner place at Ami Ami, lunch at Da Kitchen, or ice cream in the Dophin plaza. Go to the beach across the street and catch some waves, snorkel, or just relax with a book. Kihei is also the driest place on the island so rain hardly ever hits the area. You'll basically get sun almost every day of the year. After years of staying at many different condo's in the area, we didn't even think twice about buying at another place. Maui Vista has it all! Maui Vista also has so much to offer on property with the 3 pools, 6 tennis courts, 6 gas grills, and even a pool side informational meeting for new tourists. You don't even need to leave the property to book some great excursions like Luaus, Whale Watching, or even Surfing lessons. You're also right around the corner from groceries, 24 hour medical, and don't forget the marina where you catch a boat and go snorkeling at Molokini! Walk in shower with double shower head, built in corner seat, and new cabinetry. Directly across the street from one of Maui's Best beaches - Charlie Young Beach/Kamaole 1. Condo was comfortable and served our needs. Bruce T.Live in Fox Lake, Illinois. Suburb of Chicago. The condo was very comfortable. The condo was well stocked with kitchen needs and bathroom needs as well as cleaning supplies. Kitchen appliances are very nice. The beach towels and beach chairs were a nice touch. The bed was very comfortable. Overall very good accommodations. Lighting in some areas of the condo are inadequate. Air conditioning, comfortable bed, updated and nicely decorated. Great location close to food and shopping. The condo had everything we needed and exceeded our expectations. We loved our stay! Beautiful Condo steps from everything! We just stayed here and it was perfect! Becca & Mike really had everything we could possibly need and more, including things like condiments, spices, ziplock bags, beach accessories, all the bells & whistles for the kitchen, everything was thought of. The condo was steps away from the beach, restaurants, shops, parks, you name it. We would highly recommend it and hope to come back soon. My husband I spent our anniversary at this condo in September 2018, and we couldn't have been happier. It's within walking distance to many restaurants and stores, and is right across the street from an amazing beach where we snorkeled and boogie boarded. The condo was stalked with absolutely everything we could have needed: Keurig, blender, extra pillows, dishes, snorkel equipment, boogie boards, towels, umbrellas, coolers... literally everything! It made our first experience in Hawaii a perfect one! We spent a whole month in this beautifully decorated and fully equipped condo. You will not need a thing. It is within easy walking distance of everything . Best of all it definitely felt like it was “our” own home away from home. You may not have an ocean view but it is only a short walk away and you get to meet so many nice people . Thanks Becca for everything. We miss it already . Rates are subject to change until reservation is confirmed. Rental agreement must be signed and returned to attain door codes and entry to rental property.